Cornus florida (flowering dogwood) is in the family Cornaceae and native to eastern North America, from southern Maine west to southern Ontario, Illinois, and eastern Kansas, and south to northern Florida and eastern Texas, with a disjunct population in Nuevo León and Veracruz in eastern Mexico. Flowering dogwood is a small deciduous tree growing to 10 m (33 ft) high, often wider than it is tall when mature, with a trunk diameter of up to 30 cm (1 ft). A 10-year-old tree will stand about 5 m (16 ft) tall. The leaves are opposite, simple, ovate, 6–13 cm long and 4–6 cm broad, with an apparently entire margin (actually very finely toothed, under a lens); they turn a rich red-brown in fall. The "petals" are anatomically, bracts. Dogwood 'flowers' are anatomically large, whaite subtending bracts. The flowers are individually small and inconspicuous, with four greenish-yellow bracts 4 mm long. Around 20 flowers are produced in a dense, rounded, umbel-shaped inflorescence, or flower-head, 1–2 cm in diameter. The flower-head is surrounded by four conspicuous large white, pink or red "petals" (actually bracts), each bract 3 cm long and 2.5 cm broad, rounded, and often with a distinct notch at the apex. The flowers are bisexual. When in the wild they can typically be found at the forest edge and on dry ridges. While most of the wild trees have white bracts, some selected cultivars of this tree have pink bracts, some almost a true red. They typically flower in early April in the southern part of their range, to late April or early May in northern and high altitude areas. The Asian counterpart, Kousa Dogwood (Cornus kousa), flowers 3 - 4 weeks later. 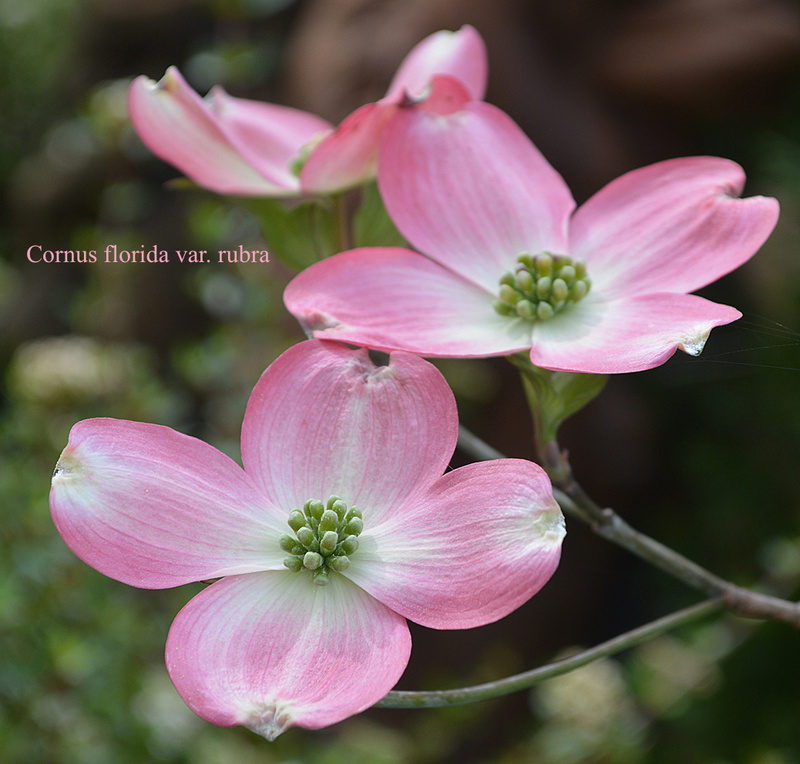 We have a nice supply of pink dogwoods Cornus florida var. rubra and the large flowered, anthracnose resistant, "Appalachian Spring" are available at $44.50 per 4'- 5', nicely branced tree.